“Lee & Me” by Wendy Borders Gauntner is an honest book about a mother and her son, and the love and challenges facing each of them. The author opens up her heart and shares her struggles in raising her internationally adopted son from Korea. The book opens with the story of the adoption of Lee, and the great effort it took in just getting a child. After years of effort and waiting, Wendy and her husband were only given three days notice that their child was ready to be picked up. With very little time to prepare, they began their journey of parenthood, with some normal bumps along the way. In time, the bumps became more than ordinary, and this mother fought to keep some normalcy in their home. As Lee’s tantrums and night terrors got worse, she felt more and more helpless. Mothers she associated with could not really relate to her struggles or the issues involving an internationally adopted child. The abandonment issues are deep and real, and a toddler has no way of communicating those feelings and fears except through screaming. After much study, Ms. Gauntner learned more and more about Adverse Childhood Experiences (ACEs) and Reactive Attachment Disorder (RAD). What typically happens with children who have suffered from adverse childhood experiences is that they will test all their relationships to make sure they will not be abandoned. These tests are usually very difficult on everyone, and it takes great patience and understanding to withstand the trial put upon those being tested. The author and Lee’s teachers experienced these relationship tests often. Lee tested his mother’s love most often, and acted differently when they were in public together. When Lee struggled with something at school, he would act out in other ways. For example, when he didn’t pass a spelling test, he began stealing things from school. One big key that grabbed me is when Ms. Gauntner shares her experience with others asking when Lee was adopted. When says he was almost two years old, the typical comment was that he was too young to remember it all. Gauntner goes on to explain that is not true at all. Experiences in infancy can have a significant effect on a child. My husband was also adopted, and lived in a foster home for 9 months before being adopted, and he has significant struggles to this day as a 45-year-old man. It takes great effort and patience as a child or adult going through the struggles, and being in a significant relationship with the adoptee as well. “Lee & Me” by Wendy Borders Gauntner has so much to offer anyone who is part of the life of an adopted child. 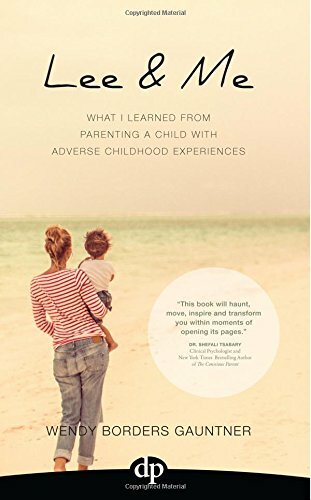 The author not only bears her heart and soul about her personal experiences with her son, but she offers insight into what she has learned that can help make everyone more successful in their own experience. Ms. Gauntner also provides a wonderful sense of humor amidst her daily challenges, which is very refreshing! Thank you for writing this book! It is much needed!